You want to buy a handpan, but you feel lost? This is the guide you need to make the best decision for your future purchase. In 2001, everything was much simpler. There was only one type of instrument, the Hang from PANArt. You just had to go to visit them, try the instruments, and you could either buy it and go back home with it or place an order. Over the years that followed, it became increasingly difficult to get an instrument. As awareness of the Hang grew, demand for them increased exponentially, and PANArt quickly became unable to meet everyone’s requests. In 2013, PANArt stopped manufacturing instruments, and while there were several alternative manufacturers who had started creating instruments, their waiting lists were long, due to pent up demand. During this time, it was not uncommon to wait between one and three years to get a handpan, especially if you had no connection to the handpan world. 1. What is the price of a handpan? A handpan is not that expensive for a handmade instrument, but they are far from cheap. The price of 90% of handpans ranges between $1,500 and $3,000 USD. The big problem, however, is that the instrument is so sought after that some see it as an opportunity to make money. That’s why you will find manufacturers that sell instruments that are too expensive compared to the quality they offer, or people reselling instruments for far more than they originally acquired them for. In other words, quality is not always proportionate to price. You will therefore find superb instruments for $1,500 USD and some poor-quality instruments for $3,000 USD or more. But, do not be afraid! Your ear, with a little bit of practice, will help you make the right decision. You do not need to be an expert to know which instrument to buy, and the information here will help you. 2. How do I choose my handpan? This is a huge question, and there is no simple or easy answer. In fact, this question will be the subject of its own article in the coming weeks. For now, here are a few thoughts to consider. To sharpen your ears, search YouTube (by typing “handpan”) and navigate from link to link to listen to many different videos. Put on a headset to better perceive the subtleties of each instrument: tone, sustain, tuning, balance between notes, dynamics of instrument, etc. Then, write down the names of the manufacturers you liked the most. The more videos you watch, the more you will quickly hear the instruments that sound like saucepans and those of top quality. The number of views of a video can also be an indicator of the quality of an instrument. Be cautious, however, as the video may have become popular due to some gimmick (someone who plays in the water or who beats the instrument overly hard). In addition to listening to the quality of the instruments, listen to the different scales, and write down those you like the most. You may prefer different types of scales: the serious or the acute, minor or major, oriental or less typed, jazzy, bluesy, celtic, etc. You will normally find in the description of the video or in the video itself the name of the scale and/or its notes. Write down as much information as possible to communicate to the manufacturer on the day you place your order. It is important to note that manufacturers, for various reasons that I will not detail in this article, are not all willing to produce every scale. Ask them if they will manufacture your preferred scale, and be prepared to select from the manufacturer’s available list or to choose an alternative manufacturer. 3. How to find and contact a manufacturer? You now have a list of manufacturers and a list of scales that you like. Of course, everything changes from one person to another. We all have our own tastes and selection criteria. I could bet that if you have really watched a lot of videos, you will have identified good manufacturers and avoided some “saucepans”. Before contacting the manufacturer, do not hesitate to show the results of your searches on the Facebook page handpan instruments. This community has good connoisseurs. Although we do not all like the same things, there are still manufacturers for whom 90% of the players are unanimous about the good or bad quality of their handpans. In the end, your ear will be the best judge. You need the instrument YOU like. they put their contact information in the YouTube video you liked or in its description. ask the help of the community on Facebook to know how to contact them. 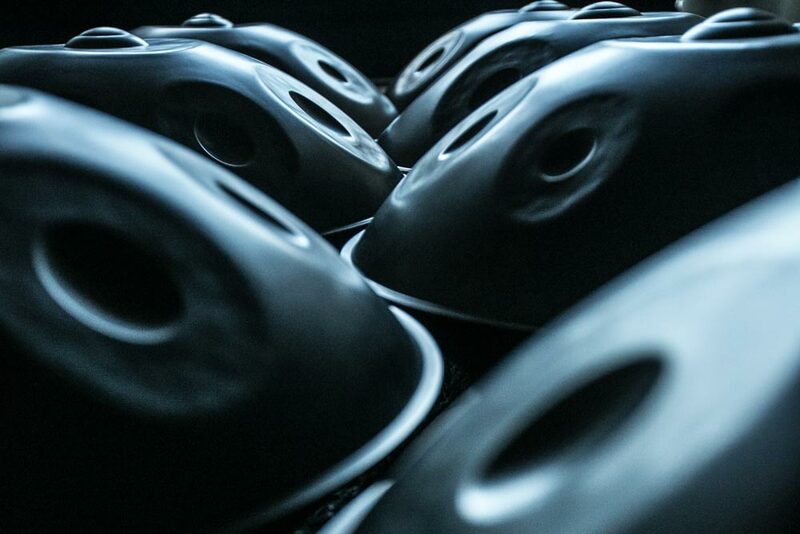 ‍[UPDATE] We made it easy for you to buy your perfect hang with the most comprehensive handpan directory : Scales, price, materials, waiting list, delivery options... Easily compare handpan brands & makers and buy a handpan that fits your needs! Check it out here. 4. How do manufacturers work? Some make a waiting list, in which case you should ask them to add your name to it. Others make flash sales on their Facebook page and/or their website. So follow their news. Others can do one at a time. In this case, nothing more simple! Others have a “closed” waiting list, and are finishing the manufacture of the instruments already ordered. It will be necessary to wait for the reopening of the list. Some have lists for 1 year, others have lists for 20 instruments, and so on. If they do not list on their Facebook page or website what their procedure is, contact them and ask. It’s worth saying twice: follow their news closely. Be careful, for some very popular manufacturers, lists fill very quickly, sometimes in just a few minutes; be ready! Others will not answer you at all. They receiving an amazing number of emails and Facebook messages every day! It’s huge! Stay patient and continue your research. 5. Small details to talk through with the manufacturers. Before you purchase from them, make sure that they have an after-sales service, if ever the instrument was to go out of tune, for example. Ask them what to do if it ever happens. Discuss the best way to retrieve your instrument. If they will send it to you by post, then you will have to anticipate the shipping costs and ensure that it will be well protected in a solid case. I personally recommend Hardcase Technologies. You may be able to pick it up by hand. Personally, I like to meet the artisan. Obviously, depending on where he lives, it is not always possible. Some manufacturers really like to meet the future buyer of the instrument on which they have spent so many hours and put so much love. Your purchase takes on a whole new dimension when you get to know them. If you can afford it, I encourage you to do it. Ask if there are particular things to know about the instrument. Things not to do, maintenance tips, products, retuning, etc. 6. How to pay for your Handpan? Be careful when down payments or deposits are required to be on a waiting list. Make sure that this was the case for all other holders of an instrument of this brand, and that they all received their instruments. You will have to pay before you have the instrument. Do not be afraid, you will have your instrument. Of course, if a manufacturer is shady and unclear in any of your exchanges, be careful. Try to learn as much as possible about them before completing the purchase. The best, and most common, way is when the manufacturer asks you to pay once the instrument is ready and provides a small video to show it to you before receiving payment and shipping the instrument. Be reassured, if you have done good research on the manufacturer and you have asked the community for help if you were unsure, you can pay for the instrument in advance. Just take extra caution for lesser known or brand new manufacturers, but please give them a chance. They are just starting their businesses. 7. How to buy a handpan from a third party? There are many purchases and resales in this community and you may choose to buy a handpan “second hand”. No stress, it can be done very securely. Just take some precautions. You can make sure that the seller really owns the instrument. Indeed, as in any sale, you can always come across a malicious person who tries to sell you a fictitious instrument that you will never receive. You will be able to try the instrument and confirm or not the feeling that you had when you listened to it on the Internet. Believe me, an instrument can really sound different in person than in the videos. Plus, it’s always nice to meet another human being when you have the opportunity ;). On the other hand, if you buy exclusively over the Internet, be very vigilant. Inquire about the person, look to see if the person is known in the handpan world or on Facebook. Ask for photos and videos. You can, for example, ask for a picture of the instrument with a small spoon next to it. If the person does not have the instrument, he or she will have trouble providing you with the picture. Here is another small trick to make sure the person has the instrument: tell the person you can probably move and pick it up by hand. You will, by this question, be able to test the seller’s reaction. If the person has the instrument, they will tell you to come and see it. If the person does not have the instrument, they will invent excuses (“No, but the instrument is with my aunt and I did not have it here” and other nonsense) and will try by all means to avoid you coming to see the instrument. To summarize, try to meet in-person, pay special attention to Craiglist and eBay, on which a lot of scams have been recorded. In any case, do not forget to ask the online community of players. 8. Do not be in a hurry! You cannot imagine how many people are full of regret after their handpan purchase. Believe me, it’s better to wait a few more months and make the “right” purchase, rather than find yourself with an instrument that will not give you any satisfaction. A few years ago, buyers jumped impulsively on the slightest opportunity to acquire a handpan, as it was really very difficult to find one. Things are changing. Be patient. It is also frequently difficult to sell a poor quality handpan, so it’s important that you make an informed decision at the outset. I wish you a good purchase! Have you just bought your first handpan? Do you have any advice to give? Share it in the comments!